Turks and Caicos is well known for its beautiful beaches, and Five Turtles Villa gives you direct access to one of the finest on the island. This popular 4-bedroom villa is just steps from Taylor Bay beach and is perfect for families (especially with young children), couples, or a group of friends traveling together. There’s lots of privacy inside the home, as well as plenty of room to relax. The ocean view from the terrace is gorgeous, and the private swimming pool is perfect for lounging and soaking up the sun. Tennis courts are nearby for working up a sweat before rinsing off in the outdoor shower. 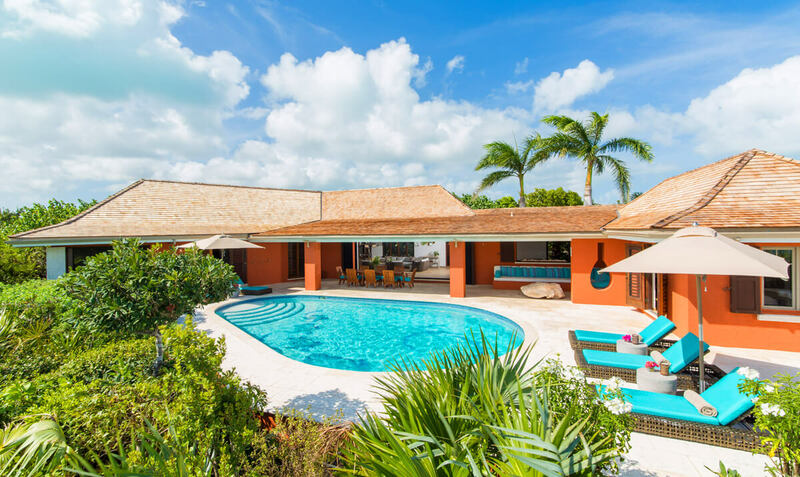 Five Turtles is an upscale villa on the south side of Turks and Caicos, just steps from Taylor Bay. Sunset views, child-friendly amenities, and weekly housekeeping makes this the perfect family vacation rental. The swimming pool hints at the villa’s name, with five turtles tiled onto the bottom. The pool is bordered by a patio with loungers, umbrellas, and al fresco dining. Gardens wrap around the villa to add privacy without obstructing the ocean view. The spacious, airy living room has plush furnishings, a plasma TV, and an entertainment center. Ceiling fans and retractable wall-to-wall sliders let the island breeze drift through and open the room completely to the tropical view. The indoor dining room can seat six, and the gourmet kitchen has stainless steel appliances, granite countertops, a large prep island, and a breakfast bar. All four bedrooms have air-conditioning, and the two king bedrooms have TVs and exterior access. The Master Suite has a king-sized, 4-poster bed and a large ensuite bathroom with an outdoor shower and patio. The queen bedroom has an ensuite bathroom and garden view. The third and fourth bedrooms work great for a couple with young children since the two rooms share a bath, one has two twin beds and the other has a king-sized bed. The twin bedroom is an ideal children’s hideaway, with a small living area so kids can watch their own movies while mom and dad kick back and enjoy some alone time. Providenciales’ resort area is only a 15-minute drive away, with restaurants, shopping, and activities. For even more convenient entertainment, there’s tennis courts just two minutes down the road and Las Brisas, a great restaurant with open-air dining and a pool. This is the second time we’ve booked with Wheretostay.com and visited the Five Turtles Villa in Turks and Caicos. This was such a beautiful villa, it’s well-designed with optimum proximity to the tranquil Taylor Bay beach. The waters were so placid, which was perfect for a family with little kids. Plus, the villa was well stocked with all sorts of kitchen, beach, and pool items. We had a lovely dinner with Chef Latika, who Andrew recommended. The curry grouper was delicious! Even my picky, 6 year old son gobbled up the fish cakes. Andrew was very helpful in answering all our questions and getting back to us promptly. His recommendation for a private chef was spot on! We always love staying at Five Turtles - everything runs so smoothly with booking and check-in / check-out. We had a small problem with the hot water heater this time, and our contact made sure it was resolved quickly and unobtrusively. Taylor Bay is a beautiful location. It was a little crowded this time with lots of kids and some loud music, so we may avoid Spring Break week on our next visit. Otherwise, it’s the perfect place to be! The house is clean, beautiful, and nicely updated - we love it! Everything with WhereToStay is handled quickly and efficiently. They’re always helpful and very friendly - see above. The pictures do not do justice to this charming villa. We had a wonderful week. The beach is gorgeous and the sunsets are magnificent. The layout of the villa is perfect, and we had a lot of fun. Booking through WhereToStay.com was very helpful. Andrew was terrific with suggestions and planning in advance. Julian was immediately available onsite whenever we needed help. Five Turtles Villa is awesome. We had a wonderful time. This place was beautiful and had all the amenities of home. There was plenty of space for our family. We loved it and would definitely go back. Andrew was awesome. This was our second trip to Turks and Caicos and second time working with Andrew. Our stay at Five Turtles was fantastic! It is absolutely our best and most memorable vacation ever! We have sent several friends and work colleagues Andrew’s contact information with the highest of recommendations. Thank you Andrew! We just returned from 10 fabulous days at Five Turtles. We traveled with another couple to celebrate our 25th anniversaries and it couldn’t have been more perfect. We were happy we even make it there in the midst of Hurricane Andrew threatening to change our plans, but American Airlines flew right around it! We have been to the Turks 3 other times but have always stayed at a resort. Renting a villa is the way to go if you really want to relax and experience the island. Five Turtles exceeded our expectations. Every day we would wake up and enjoy coffee and breakfast made in our well appointed kitchen. They had everything a discerning chef would need to make every meal. Walk out the gate and along the sand dollar stepping stones and you were on your private beach because there is typically not any one else there. We loved the tree for our own personal use and shade. The beach chairs we could carry to the beach were fantastic, perfect for lazing the day away. The kayaks and paddle boards were also put to use daily; that was an unexpected surprise. There were beach towels for use along with sunscreen and bug spray . We had brought our own but good to know that it was there. The pool was refreshing and perfect temperature. The villa was clean, and kept in perfect condition. We rented a car and tried all the local eateries that were opened since we were traveling during off season. We will be back! Andrew felt like my best friend by the time we arrived. He had to deal with me and my craziness fearing that the trip would be cancelled due to the hurricane but he stayed calm and in contact with me each day leading up to the trip. Before booking he was a wealth of information as to which house he thought would suit our needs most and was spot on in his recommendation. The couple we traveled with had never been to the Caribbean and they were so happy with the choice we made and all of Andrews recommendations. It really couldn’t have been any better. Thanks to Andrew, and all at Where to Stay we could not have had a better experience in T&C. Andrew was very communicative with all aspects of the Villa, our arrival instructions, and Island “TO DO’s, and To Dine”. Taylors Bay, and the Five Turtles Villa exceeded all expectations. We had 4 adults, and 4 children ages 7-11. The FTV was more than ample in both interior and patio space. The Villa was very clean, and well stocked with kitchen and bath supplies. The water sports equipment available with the Villa, the depth of the ocean, and secured fenced property allowed us to never be concerned for children’s safety. Again, Highly recommend the team at Where to Stay, especially Andrew. Pick a location, and seek his input. Your family will not be disappointed. Regards, The Mann Family. This was our second year at Five Turtles, and we found it as enjoyable as the first. The house is beautiful, well-located, and it is fronted by what we’ve decided is the most beautiful beach in Turks & Caicos! 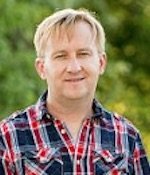 Our booking and related communications went smoothly and were handled in a friendly and professional manner by Andrew. Good for stays from May 6, 2019 to May 14, 2019.